Today is my birthday. We are also celebrating the 6th anniversary of Girl Who Reads. And what is a celebration without surprises? We are once again offering a mystery box giveaway! It will be filled with a book or two and other bookish goodies. I do hope you will enter. Christine Brae, author of In This Life, is joining us today and has graciously offered an item for the mystery box. In This Life follows the story of Anna Dillon, who wants to escape her busy life in New York City before she starts medical school in the spring. She ends up volunteering on a medical mission in Thailand with her best friend, Dante. There she meets the passionate and enigmatic Jude Grayson. They’re immediately drawn to him and they share a brief, but fervent affair. Then Anna has to rush home for a medical emergency, and Jude promises that he’ll stay in touch. But he doesn’t, and Anna tries desperately to move on. Five years later, and she’s married Dante, after giving up hope that Jude will ever return. And then one day, in a chance meeting, they come face to face again. then she learns the life-altering secret of why Jude never called, and why they can’t be together. But passion that ignited on that Thai beach never died, and it becomes impossible for them to stay apart. 1.) What inspired you to write In This Life? I wrote In This Life at a time when I was searching for answers for the inexplicable things that had happened to me in the last two years. My books are a reflection of my emotions and feelings at various stages in my life. The stories may or may not be all fiction, but the emotions, thoughts, and words are real. 2.) What made you decide to set part of the book in Thailand? I have a wonderful job that allows me to travel to many cool places. I try to take the reader with me with every book I write, by showing them parts of the world that they may have never visited. In This Life is about a girl who goes on a mission to help the less fortunate who suffered from a natural calamity. I chose this setting simply because it was where the tsunami happened in early 2000. 3.) 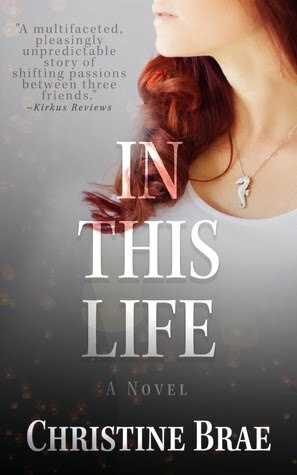 In This Life was just optioned to become a movie? How does that feel? Oh my gosh! I still can’t believe that it happened! I mean, how funny is it that someone reads your book by mistake, gets hooked, and contacts you about optioning it for film? And then, that person becomes your friend! Sometimes, I forget how famous Adrian and Emmanuelle really are. They are just so down to earth and real, it’s like finding a long lost friend and picking up where you leave off. 4.) Are there any secrets or details that you’re allowed to share? Will you be involved in the screenwriting process? I’m just so fortunate that the actors who optioned the book are keeping me so involved and updated every step of the way! As everyone knows, it takes a very long time to make a movie. Adrian feels so strongly about keeping the essence of the story intact, that they have been in discussions with screenwriters for quite a while. I am happy to report that we should have a screenplay in the next few weeks. 5.) Aside from the movie option, is there anything else you’ve got planned for the future? The movie option was the highlight of my 2016 year! I am so looking forward to the next phase of this process and seeing who will be cast as Jude and Dante! But I must tell you – I have a new book, Eight Goodbyes – which I just finished and am so proud to share with you this year. It’s a simple, not angsty, not tear-jerkery book that I really think you’ll enjoy. The movie and a new book and two book tours this year – I think I can tell you that I’ve got 2017 well covered.